As exciting as SpaceX's Falcon Heavy launch was — a marvel of both engineering and publicity with Elon Musk's Tesla Roadster along for the ride — we should remember that the wonders of space, with its "billions and billions" of planets and stars, are not the exclusive domain of a few billionaires. Not when tens of millions of students have the means to send their own experiments into space. We should recognize that fact, because space can and should inspire people of all ages, regardless of status or income. It has never been more straightforward for learners to access microgravity. Today they can work directly with organizations that provide access for student research to fly to space via companies like DreamUp, Higher Orbits, the Student Spaceflight Experiments Program (SSEP) or the Center for the Advancement of Science in Space (CASIS). Through these programs, students' experiments can fly to the International Space Station or on a suborbital flight on the Blue Origin New Shepard space vehicle. The sky is no longer the limit. From STEM to stern, so to speak; from the classroom to the launch pad; from watching an industry titan achieve his dream to seeing the nation's students fulfill their own dreams, we need to democratize the quest for space. We need to enable students to get hands-on experience with space science, not just because it matters to educators and learners, but because research and exploration matters for the survival and success of humanity. Consider, then, the Falcon Heavy launch as America's latest "moonshot." Think of the quest for space as a challenge not from without, but from within. 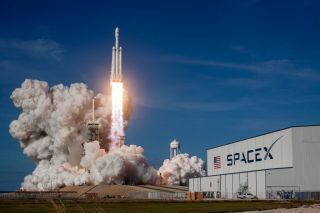 Let SpaceX's achievement serve as an inspiration to all curious minds, and let the thrust of the rockets and the sound of their engines be a roaring call to action, with Musk's remarkable feat daring us to be as ingenious and innovative as we must be to launch our own projects. America's students are able and willing to accomplish this mission, but we need communities to invest in the programs that will enable and support teachers to pursue these opportunities. We must do this, not because it is easy, but because it is the best way to prepare future generations for the new space age. Let us maintain the enthusiasm of the Falcon Heavy launch. But let us apply that spirit to the classroom, where we can educate––and empower––millions to do for billions what is not just the province of billionaires.